I always crave it. I need it. I have to have it every day in one form or another… as long as it’s in moderation. I love chocolate. Chocolate is just one of those vices that many people have a love-hate relationship with. They love it, but hate the “nutritional benefits” of it. Many people won’t let themselves indulge in it because it is a fatty and highly calorific sweet in which they have no willpower. For me, a self-proclaimed chocoholic, I have it in one form or another every single day, typically as an after dinner treat. I have it stashed in different parts of my room, including the freezer. My friends even laugh at me because I have a few bars tucked away in my safe. And while I know it’s not the healthiest indulgence, it always satisfies my craving. For many people, the conversation revolving around chocolate has usually been about its presence for dessert. However, there are lesser-known aspects of the chocolate conversation. These include the nutritional benefits, “cocoa-nomics,” and dangerous environmental effects. For those who believe that eating chocolate is just a sinful snack, think again. There are proven health benefits to eating chocolate everyday. Chocolate has been shown to decrease the risk of heart attack, stroke, and blood pressure. It has also been proven to show an increase in cognitive skills, and help lower one’s body mass index. However, it’s important to note that that not all chocolate has these benefits. 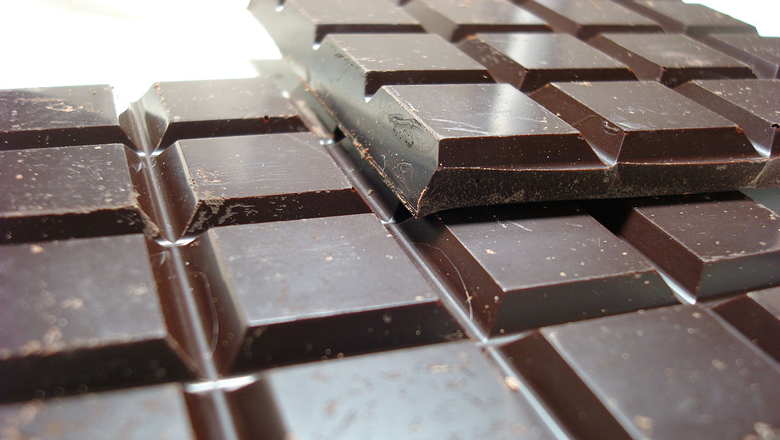 Nutritionists suggest that only eating a small amount (about an ounce) of dark chocolate, preferably 60 percent cacao or higher, will provide these benefits because of the flavonoids they contain. Flavonoids, a natural-plant based antioxidant, have been found to promote artery health. To put it in perspective, dark chocolate has about five times the amount of flavonoids as an apple. Despite the potential health benefits of chocolate, there is a dark side to this story. When you look at the “cocoa-nomics” of the situation, the chocolate industry is worth about $110 billion a year. Much of the world’s cocoa comes from West Africa with a third coming from the Ivory Coast. Despite the booming industry, many of the small family plantations that grow cocoa are living in poverty. In Ivory Coast, a cocoa farmer will make seven euros a day, and because chocolate sells for two euros, no worker can afford to buy chocolate. It’s estimated that these workers receive about three percent of what we pay at the grocery store, which means a cocoa farmer is merely making a few pennies off your purchase. If this thought doesn’t sadden you enough, look how excited these farmers in Ivory Coast get when they have the opportunity to try chocolate for the first time. Chocolate prefers to grow in the rainforest because it likes shady conditions and high biodiversity, but hybrid versions are grown on cleared land as monocultures with full exposure to the sun. While this hybrid version produces larger short term yields, it is not a sustainable solution. There are temporary solutions available. Chocolate companies like sweetriot and TCHO believe in fair trade with developing countries and produce only organic chocolate. This way, people can still get their nutritional benefits from chocolate and support the farmers who grow the cocoa. If the economic and environmental costs scare you from ever eating chocolate again remember the nutritional benefits. So next time your chocolate craving hits, give in to the craving, but try reaching for dark and fair trade chocolate - you’ll be doing yourself and the world a favor. Sam Cohen is a junior studying Journalism and Mass Communication at The George Washington University. Top photo courtesy John Loo.